Kirby and the Rainbow Curse Review – Eggplante! You’ve got to hand it to Kirby. No matter what you mould the little pink puffball into, he’s still arguably the most adorable and charming of Nintendo’s flagship characters. Nintendo is cranking both the charm and the moulding to maximum with their latest offering, Kirby and the Rainbow Curse, a long overdue follow-up to the highly imaginative and incredibly fun Kirby: Canvas Curse on DS. Launching a whole decade after its predecessor, Kirby and the Rainbow Curse has sacrificed portability to release for Wii U, having players use the Wii U Gamepad screen and stylus to guide the round, perpetually ball-shaped Kirby variant through a new selection of colourful, challenging gauntlets across seven different worlds. 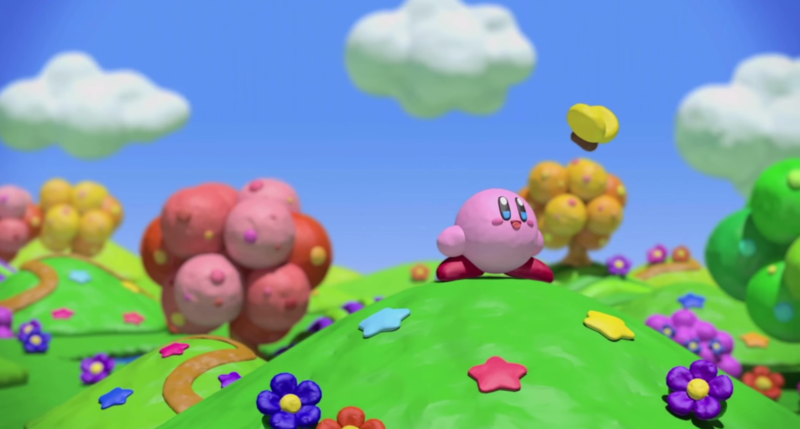 Of course, that’s not the only thing separating Kirby and the Rainbow Curse from the series’ mainline offerings, as it’s also the first game to be rendered in a polymer clay style. This makes the entire production appear to be lovingly hand-crafted with plasticine, almost akin to claymation, and it makes wonderful use of the sharp HD capability powering Wii U. Truly, Kirby has never been more aggressively, inconceivably cute, and this is still considering the likes of titles like Kirby’s Epic Yarn and Kirby: Mass Attack! For all of its heart-gushing and big smiles though, how does Kirby and the Rainbow Curse stack up as a game? Well, it’s good, even if it’s a slight step down from Kirby: Canvas Curse. The production values are the best thing about the game, which is still remarkably fun to play for the most part (especially with friends! 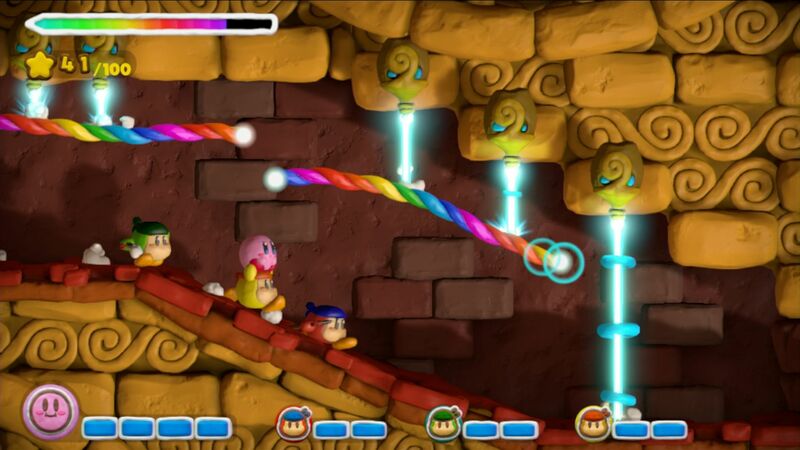 ), though Kirby and the Rainbow Curse doesn’t feel as universally tightly-designed as many other recent Kirby efforts. The experience is sometimes dragged down by some passing control issues and other such hiccups, and young/inexperienced players may be frustrated by the startling degree of challenge in the later parts of the game especially. If you’re a serious Wii U gamer that’s looking for something creative and memorable though, Kirby and the Rainbow Curse makes for an enjoyable challenge, and a sharp use of the Wii U technology. Be careful however, as its hazardous stages have more bite than the cute exterior would suggest! 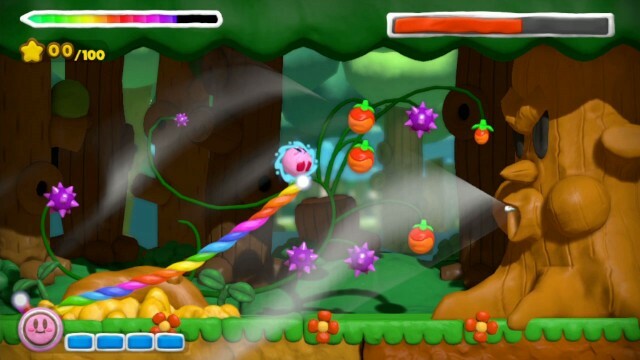 Even the most hardened of gamers need take only one look at Kirby and the Rainbow Curse to fall in love with it. Its claymation style is instantly loveable and infectious, and provides a wonderful and unique new art style unlike any that a Kirby game has delivered before. The cute and colourful plasticine presentation, sublimely realized in every way, will help keep players having fun, even when they run into tough sections. For some of its especially challenging areas, Kirby and the Rainbow Curse always looks friendly and innocent, and it has that special Nintendo charm in spades, where the game clearly wants you to just have fun and enjoy yourself. The incredible amount of detail put into the polymer clay animation marks some of the best graphics that Wii U has ever delivered to date as well! Even just drawing lines for Kirby to follow on the Wii U Gamepad Screen is a delight, with their rainbow sheen accompanying interlocking layers of clay that somehow look so finely-crafted, even when you’re frantically swiping to steer Kirby away from a pit or an enemy. Similarly, enemies animate and emote with amazing levels of vibrancy within the clay style, as does Kirby himself, who will sometimes flatten and be re-shaped in other such ways, as if he were truly a clay display before the player. Frankly, Kirby and the Rainbow Curse looks quite unlike any other game in existence, and that’s a great thing when it looks this cheerful and colourful! Even when viewed on the Wii U Gamepad Screen, which is necessary for all but accompanying co-op players that navigate on the television, everything leaps out of the display as if it were a candy-coated clay diorama, in living motion. The fact that there are no animation or performance stalls is all the better as well, keeping things moving smoothly, and never compromising a play session because the game had a jitter at the wrong time. Nintendo has found some truly wonderful ways to get around the technical limitations of the Wii U in contrast to the competing and stronger PS4 and Xbox One consoles, by pioneering more bold and ambitious art styles that don’t rely on raw specs as a crutch. Kirby and the Rainbow Curse might be the best visual showcase that both they and developer, HAL Laboratory have ever delivered to date as well! The Kirby series has consistently delivered great, feel-good music, wonderfully walking the line between being charming and engaging. Kirby and the Rainbow Curse is no exception, with tracks that sacrifice a bit of the punch within the majority of the music in contrast to other Kirby games, but still delivering bubbly and upbeat tunes that suit the vibrant atmosphere of the game very well. Some old favourites are part of the tracklist, as with any Kirby game, though the majority of the tracks are newly-composed, and all tunes are wonderful to listen to. The fact that repeating songs like the boss battle theme are given different composition styles depending on the environment is a nice touch too! Even if you prefer the music of other Kirby games, seeking collectible treasure chests will sometimes yield you prizes that consist of favourite songs from former games in the series, which you can listen to at your leisure in a Sound Test. You’ll get most of the game’s soundtrack by just beating it normally, but as usual, unlocking the game’s great legacy music makes for strong incentive to play well and explore. Kirby and the Rainbow Curse doesn’t offer the best soundtrack in the Kirby series by any means, but it’s a worthy one. If you’re a longtime fan however, you may miss the nostalgic showcase behind Kirby: Canvas Curse’s soundtrack during the main gameplay of its Wii U follow-up. As for the sound effects, they’re the typical sugary cartoon effects that one would come to expect from the Kirby series at large. Most of the sounds are pretty gentle, going with the plasticine style, with only sharp jolts that occur when you take damage for example, standing out amidst the rest of the audio. With that said, the sound effects are typical Kirby fare, even if most of what you’ll be hearing are the swishes of your clay lines, and the bops of Kirby impacting enemies, or taking hits, along with the familiar and occasional vocal exclamations by Kirby himself. The audio won’t turn heads the way that the visuals will, but Kirby and the Rainbow Curse delivers a pleasant, inviting experience with its soundtrack. 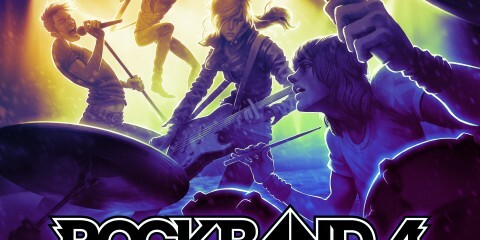 The intensity of the audio will ramp up later in the game, but never by much. There’s an innocent peace behind even the most treacherous environments of Kirby and the Rainbow Curse, with the series’ famous charm never letting up for even a second! 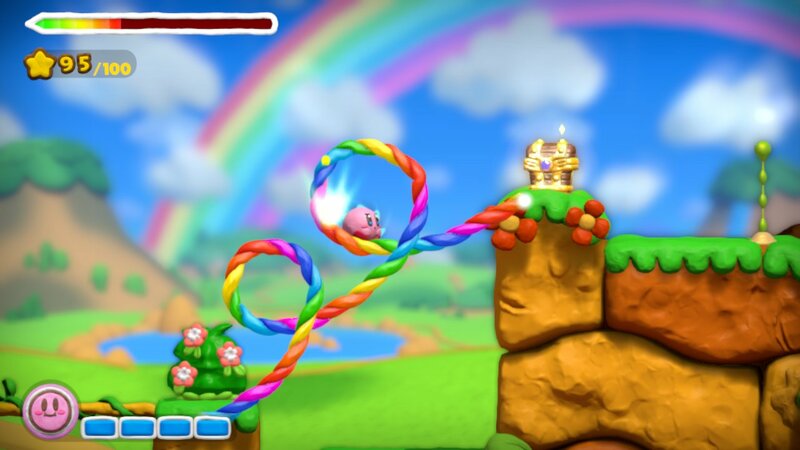 Kirby and the Rainbow Curse, like its spiritual predecessor on the DS, unfolds as a genre of action game unto itself. It’s a bit like a platformer, only you don’t run or jump in the traditional sense. Instead, you ‘guide’ Kirby more so than directly control him, drawing paths for him using clay lines spawned from your Wii U Gamepad’s stylus. It’s in this manner that you must steer Kirby around obstacles, navigate around enemies, and reach both checkpoint doors and goal rings. The object of the game is to stop the evil Claycia, who has drained the colour from Dream Land, and rendered its inhabitants frozen in monochrome. Players pursue Claycia with the help of a kindly sentient paintbrush, Elline, who accompanies Kirby into the land of Seventopia, after reviving him and a Waddle Dee. 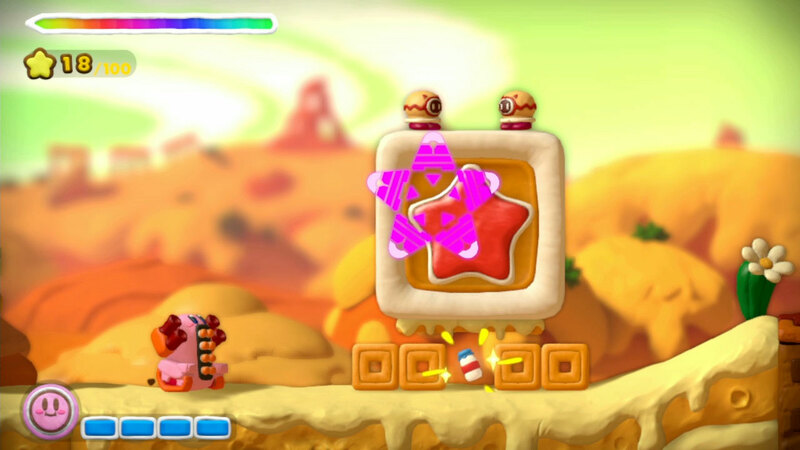 Elline also moulds Kirby into a round clay form, so that he may be re-shaped to be able to navigate Seventopia’s many challenges, and take advantage of the (player’s) Rainbow Paintbrush, which will allow him to proceed when otherwise impossible. Naturally, since he’s a ball of clay in his latest adventure, Kirby’s familiar ability to devour enemies, steal their abilities, hover through the air, and so on, are all absent in Kirby and the Rainbow Curse. Kirby is entirely at the mercy of the player’s stylus, with players needing to tap him with proper timing to ram through enemies and obstructions (which is especially crucial in the auto-scrolling stages! ), and make sure that he’s both shielded from damaging projectiles, and cushioned from falling into pits, all by using nothing but a supply of hand-drawn rainbow strands. Exercise caution however, since you can’t just wildly scribble around, willy-nilly! Players have a limited supply of Rainbow Ink, which replenishes automatically if the player doesn’t draw for a moment, but must otherwise be restored by finding pots of it during extended drawing sequences where you can’t stop, such as over a long stretch of bottomless pit. Should the player run out of ink while drawing, they’ll be left with no means to control Kirby, which could send him rolling into obstacles, or falling into instant death pits that will result in lost lives. Draw carefully, and conservatively! There’s a bit of a science to learning the ideal drawing paths in order to maximize Kirby’s movement and protection, while not expending all of your ink. Some situations will require you to draw frantically, though in many others, it’s often prudent to draw more slowly, carefully plotting your path, since careless mistakes will mean expending more ink to try and correct your sloppiness, before it gets Kirby hurt. This leads to some pretty solid level design, as first-party Nintendo games rarely struggle to deliver, with some of the devious late game obstacles being especially cool challenges that take a deceptively simple mechanic, and really force you to master it! As mentioned however, this means that Kirby and the Rainbow Curse, in spite of its appearance, is directed mostly at core gamers, not casual gamers. The later stages especially are quite challenging, and some of them will eat through the generous helping of extra lives that you’ve accumulated pretty aggressively. If you routinely die on one stage, the game will give you the option to skip it and move on, for those who frustrate easily, eliminating any pretense of a Super Guide in this case, though as usual, you’ll need to come back and properly complete the area if you want the credit, particularly the collectibles. Speaking of the collectibles, they consist of up to five treasure chests that are hidden in each stage. If you successfully reach the end of a stage, you can open any chests you’ve found to receive collectible figurines, music samples from throughout the Kirby series, and other such rewards. Many of the chests are found in devious locations that require an immense amount of drawing skill, particularly when you must quickly go after some of them in auto-scrolling areas. 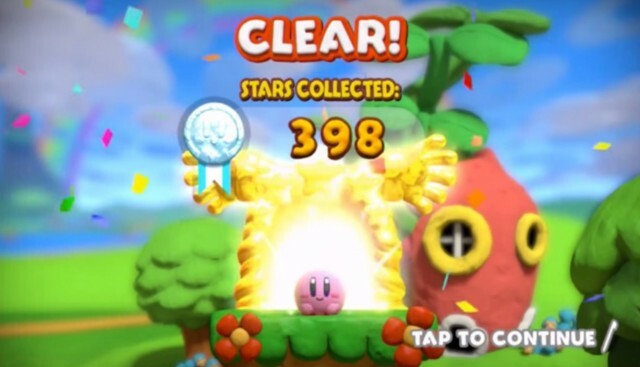 They’re decent rewards, but they’re also pretty straightforward, and only completionists and die-hard Kirby fans will feel the need to seek them out. 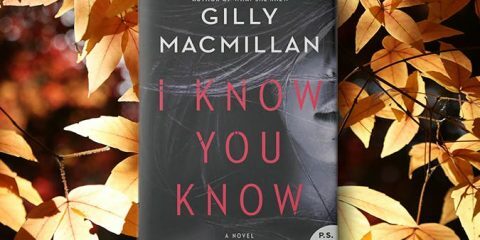 Everyone else will no doubt bypass the ones they don’t stumble into by accident, at no real expense. The only other collectible of sorts is a Medal that you are awarded at the end of each stage, depending on how many Stars you gathered during that stage. Depending on how thorough you were, you’ll get either a Bronze Medal, Silver Medal or Gold Medal, in rising order. This gives you some incentive to explore around and amass what you can, though again, there’s no direct benefit to earning Gold Medals in as many stages as you can, beyond bragging rights. Another potential issue with Kirby and the Rainbow Curse is the odd sense of pacing. Each of the game’s seven worlds is divided into three stages, and a boss battle. This seems a bit strange, as it results in stages that sometimes drag on for absurd amounts of time, even if they do have a reasonable helping of checkpoints, and may prove annoying to people who would rather play in short bursts. 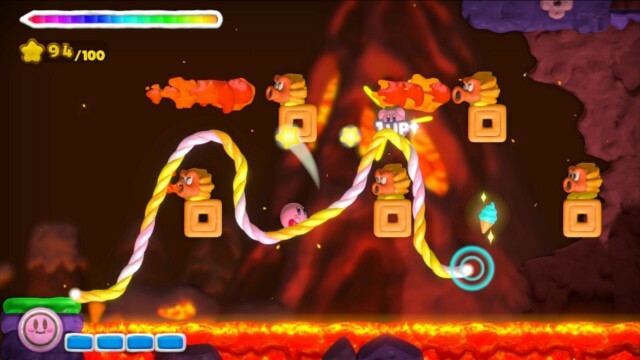 Granted, this is a console game, not a handheld game, but it begs the question of why Kirby and the Rainbow Curse didn’t divide itself into six shorter stages and a boss, rather than three lengthy stages and a boss, with the former both feeling less exhausting, and generating a greater feeling of progression. The boss battles are decent as well, but like Kirby: Canvas Curse, there just isn’t enough variety with them. The game even recycles three initial boss designs a second time each before the two-part final boss fight, with only one of them being a recognizable Kirby foe, the ever-reliable pushover boss, Whispy, who does look awesome in the plasticine style. 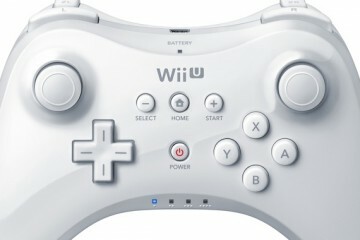 Other mainstay bosses like Kracko, Meta Knight and Mr. Shine/Mr. Bright never appear at all. Heck, even King Dedede is entirely absent from the game! While there are figurines that show what characters like Meta Knight would look like in the plasticine style, the lack of more familiar Kirby foes feels like a missed opportunity for longtime fans, given the amazing new art style, even if newcomers won’t know the difference. The closest you’ll get to the presence of King Dedede or Meta Knight is with the game’s Amiibo functionality, which allows you to scan the Kirby series Amiibo within the Super Smash Bros. set on the Wii U Gamepad’s NFC Reader, to give Kirby a set of temporary benefits that can be activated once per day. Scanning the Kirby Amiibo gives the player infinite Star Dash capability, allowing them to hold the stylus and release it to launch Kirby with a powerful attack that even breaks metal blocks (normally, this requires collecting 100 Stars to charge up), scanning the King Dedede Amiibo gives the player twice as much health via a King Dedede hat, and scanning the Meta Knight Amiibo increases Kirby’s attack power, allowing him to deal more damage when the player taps him into enemies. 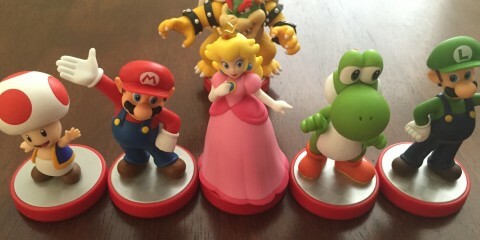 This Amiibo implementation is very cool and inspired, but it’s moot for the usual Amiibo issue, since two of these three Amiibo figurines are virtually impossible to find, mere minutes after they launched in most regions! Only the Kirby Amiibo is widely available in most stores, and some cities have even had trouble stocking that one. The King Dedede Amiibo is annoyingly rare and usually only attainable for higher prices in the grey market as it stands, but Meta Knight is even more ludicrously difficult to track down, since it was exclusively sold at Best Buy in North America (and Future Shop, for us Canadians), and sure enough, not nearly enough of the Meta Knight figurines were shipped to meet demand, meaning that there is already no more to buy legitimately. That is completely unacceptable! Seriously, Nintendo, could we start supplying to demand for your Amiibo features, please?! There’s no point in Kirby and the Rainbow Curse having this neat Amiibo functionality if you’re not even going to bother stocking and re-stocking two thirds of the figurines that work with the game at local retail outlets in most regions! Anyway, far easier to take advantage of is a highly enjoyable local multiplayer component, allowing up to three other players to activate Wii Remotes, and each assume the role of a guardian Waddle Dee, while the main player controls Kirby on the Wii U Gamepad. Those playing as a Waddle Dee can use the Wii Remote for a more traditional platformer-like experience, with Waddle Dee able to run, jump and hover through the air as Kirby would in the bulk of his games. 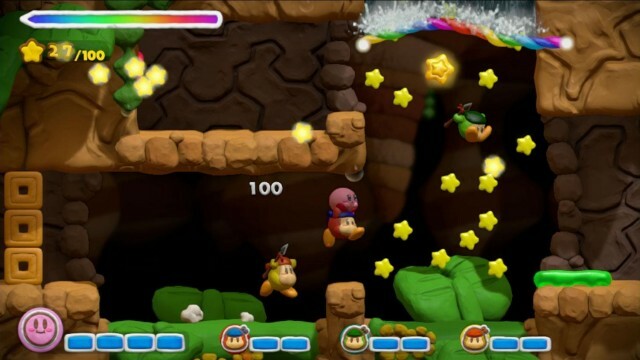 Waddle Dee also has the ability to attack with a spear, which helps him repel enemies, and more easily open the way through obstacles for Kirby to navigate through, and he can also collect Stars, and other such items that will go to Kirby. Lastly, players controlling a Waddle Dee can pick up Kirby and toss him around, in order to protect him from danger, or just torment the lead player. Should a Waddle Dee run out of health or fall into an instant death hazard, the player must mash a button to bring them back, and if Kirby loses a life, players are automatically booted back to the last checkpoint, regardless of the status of any Waddle Dee players. Playing in co-op can help ease some of the headaches in the trickier stages, particularly in the boss battles. 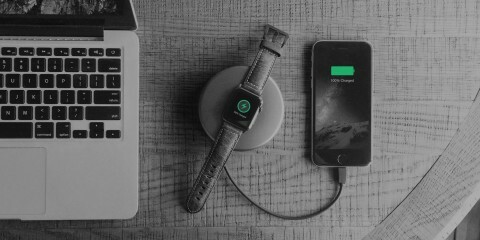 It’s hardly essential, but it’s fun, and it works well. It’s also a great way to involve a more casual or inexperienced player with the game, while the more competent and skilled player controls Kirby, helping to get around the game’s higher-than-expected difficulty. Some sections will prevent co-op players from participating, but thankfully, these are rare. Even during specialized sections, co-op players can sometimes do things like boost Kirby in his rocket form for example, still giving other players a means to participate, even when their Waddle Dee has to sit out. Fortunately, this doesn’t include most of the vehicle sections, where Kirby is turned into something such as a submarine or tank, much like Kirby’s Epic Yarn. 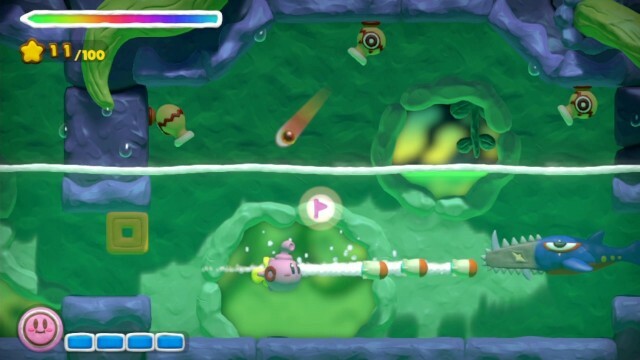 In most cases, players guide Kirby as normal, also using their stylus to guide projectiles that Kirby either fires automatically in the case of the submarine, or launches according to where players tap in the case of the tank. The vehicle sections do a solid job of breaking up gameplay variation, and mostly function well, with even any accompanying Waddle Dee players able to take up cannons and join in the mayhem during these sections. You will occasionally run into control issues with the vehicles however, and some of these will even pop up when you’re just controlling Kirby normally. The game’s stylus drawings are a bit less reliable than they were in Kirby: Canvas Curse, and while this doesn’t happen often, there will be times where Kirby gets stuck in a weird movement pattern that the player can’t stop, or simply falls through a stylus stream, should he not hit it quite right. This can result in frustrating hits and annoying deaths that aren’t the player’s fault, especially during sequences where you must draw very hastily, around things like lava that will instantly kill Kirby if he touches it. Kirby doesn’t move on a dime very well, which can be a problem with some of the harsher level hazards later in the game, and the gondola sections, where you must draw paths for the gondola to follow whenever the main track breaks or switches, are the least reliable of all. 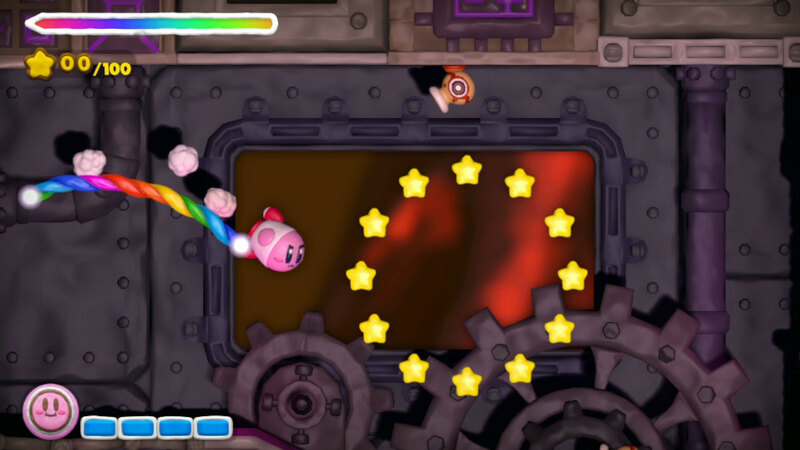 The game can be quite picky with how it wants you to draw at times, and with some hiccups in the physics, and a limited supply of ink, this sometimes creates undue frustration that can make Kirby and the Rainbow Curse get on players’ nerves very quickly. Still, for its occasional gameplay annoyances, Kirby and the Rainbow Curse makes for a fun challenge, if you enjoy gaming on your Wii U. If you don’t skip any stages, it will take anywhere from 6-8 hours to blow through the main game, depending on your skill level, but you can add more time to that by seeking out chests and Gold Medals, if you’re so inclined, on top of messing around with the extras, and taking on timed challenges that have you rounding up chests with your pinpoint drawing skills, under a strict time limit. It’s a pretty straightforward package overall, but for the reduced price of $39.99, the price is right to enjoy yourself, if you’re an enthusiast of the Wii U and/or the Kirby series. 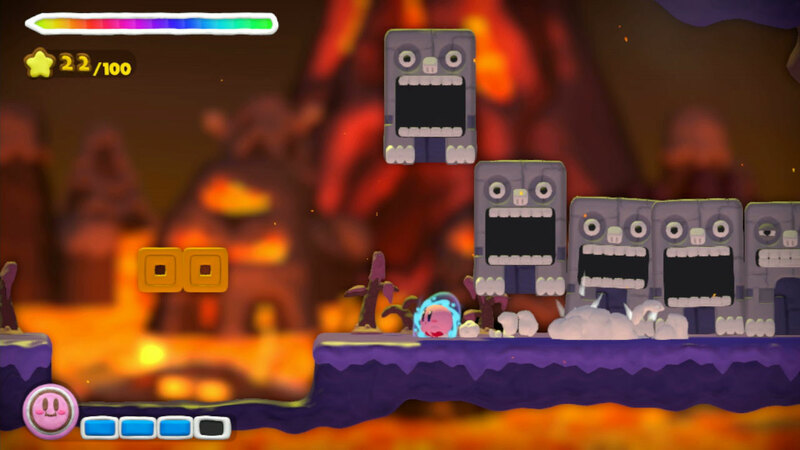 Kirby and the Rainbow Curse may fall a bit shy of the outstanding quality of Kirby: Canvas Curse, but its small handful of gameplay issues aren’t enough to distract from its breathtaking claymation style, nor its fun, engaging challenges. It’s a game that takes expert advantage of Nintendo-specific products, namely both Wii U and Amiibo, though the Amiibo shortage hitting supplies of King Dedede and Meta Knight so hard is a big knock against the game’s inspired Amiibo functionality. Fortunately, you don’t lose anything by bypassing the Amiibo features completely in Kirby and the Rainbow Curse, though the fact that most players can’t properly take advantage of most of them due to a lack of supply is nonetheless sloppy and frustrating on Nintendo’s part. Still, Kirby and the Rainbow Curse is a welcome revival of a formerly forgotten sterling innovation for the Kirby series. It’s best approached by open-minded core gamers who know what they’re doing, but the inspired co-op element helps to invite less devout or skilled gamers into the fold nicely. 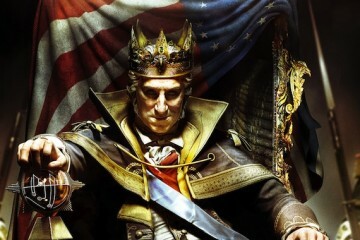 The game is a great fit for Wii U as well, but it’s not just a gimmick. 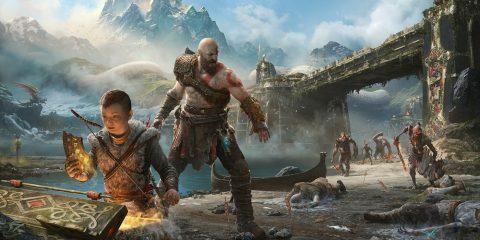 Even with some of the annoyances, the gameplay feels tight and engaging, being an action game quite unlike anything else on the platform, packed to burst with charm, and delivering a sense of challenge that feels rewarding to ultimately conquer. The fact that Kirby and the Rainbow Curse is an extra-afforable $39.99 price is all the better as well! Granted, Kirby and the Rainbow Curse will no doubt be lost under a deluge of bigger, more impressive Wii U blockbusters later this year, between Splatoon, Xenoblade Chronicles X, the new Legend of Zelda game, and the inevitable surprise Wii U games for 2015 that Nintendo hasn’t yet revealed. If you want to start your year with Wii U off right though, Kirby and the Rainbow Curse is a satisfying prelude to the console’s bigger and more impressive hits to come! 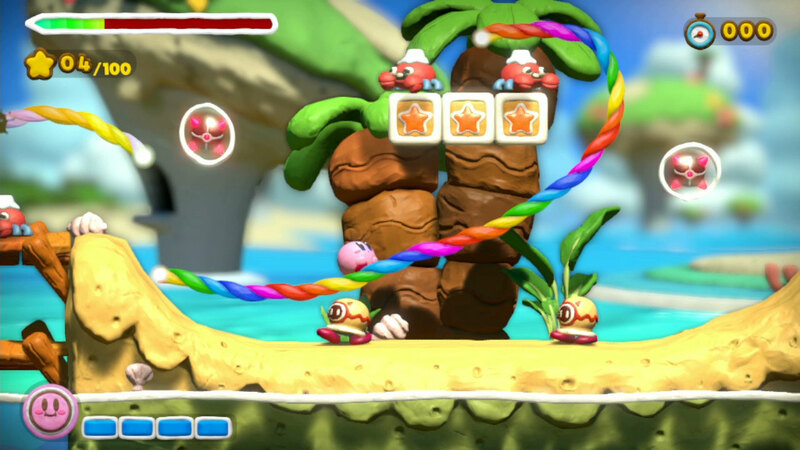 Kirby and the Rainbow Curse is an engaging and highly charming Wii U exclusive, expertly tailored for the console, and only occasionally stumbling over some technical hiccups and control nuisances.